'Does The Elephant Dance? Contemporary Indian Foreign Policy' is a study of Indian foreign policy and its evaluation on various parameters. 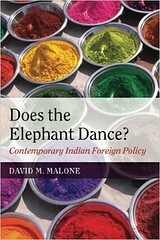 The author of this book, David M. Malone who served as the ambassador of Canada to India, has seen the framing of Indian foreign policy from close quarters and has met with actors involved in decision-making. Malone, while talking about why a book on foreign policy, says that in India there are few books on the subject and much needs to be done. In the starting few chapters, the author tries to present the historical context of India's ties and narrates the incidents of the past which can invoke emotions in the present. The author also delves into the colonial past of the India and the policies shaped by this burden of the past. The author divides the Indian foreign policy broadly into three periods where differences in policy decisions can be distinguished from other periods. The first one was under the leadership of prime minister Nehru. This period was marked by the ideological posturing where India supported anti-colonist struggle everywhere in the world tried to be the leader of poor countries recently freed from the clutches of the colonialism. Although India detached itself from the harsh realities of the bipolar world, it continued to focus on domestic issues and consolidation of India as a nation, which was predicted by many as doomed to fail given its inherent diversity and widespread poverty and illiteracy. Malone characterizes the second phase by the presence of a visible socialist tilt in Indian domestic politics under the leadership of Indira Gandhi and later under her son, Rajiv. Although India continued its lip service towards Non-Aligned Movement (NAM), it signed a security pact with USSR and became a major purchaser of Soviet defense equipment. This may have been necessary given the lavish aid being given to Pakistan by US and China, and India starting to pay the price for its idealism. The third and final phase of Indian foreign policy started with the liberalization of the Indian economy in early 90's and has continued till date. During these two decades, India became much confident and it used its economic might in foreign policy decision making. Conversely, foreign policy objectives were largely seen from an economic angle. The author also emphasizes that if India has to emerge as a superpower, it has to solve longstanding issues in South Asia and improve relations with its neighbors. No country can be a superpower if its own backyard is messy. The author sees the situation improving in this area with India renewing a cooperation treaty with Bhutan and agreeing to a greater role for UN in Nepal. The defining factor for the regional disturbance in South Asia is the longstanding rivalry between Indian and Pakistan. The author says there has to be a give and take if the problems between these two countries are to be settled and being a bigger country, India has to give more and take less. This position taken by the author seems difficult to realize given political compulsions of two countries. The author also discusses India's role in multilateral organizations and concludes that the country has become more assertive riding on its economic power. The role of India in trade negotiations under WTO has been consistently criticized by Western powers and sometimes countries initially supporting India jumped the ship. The main contention is the protectionist policies such as agricultural subsidies. Another area where India has been labeled as a spoiler is climate talks. While environmentalists have been insisting that India should cut emissions, India's point has been that a fast developing country will burn fossils to satisfy its energy needs like the West did in the past. It can be said that in these cases, the author has taken the West's line without thinking much about India's domestic compulsions. It must be said that five years can bring a huge change in a matter as fast changing as foreign policy. Although the broad contours of the India foreign policy remain same, there has been many changes including India's proactive role in multilateral organizations like BRICS, IBSA, and G20. Backed by its impressive economic performance, India has cemented its place as a rising world power. The author also says that India should invest more in human resources in the area of foreign policy, who can provide independent and valuable advice when required.